It's not an awful song. The horns are cute, if dated, and sound a lot like Missy Elliot 4 years ago. Missy Elliot was good 4 years ago, so no foul. 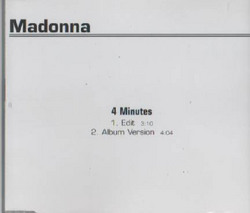 But we've got lame lyrics and self-referential name dropping between Madonna and guest Justin Timberlake that makes "Me Against the Music" sound introspective. Justin Timberlake's only real purpose is to act as MC as he hypes Madonna's name, or well, "muh-DONN-uh" as he calls her. The radio edit (amusingly brief at 3:11) is a better bet as it avoids the initial sounds of what Nelly Furtado thought better to avoid on her last album. Madonna croons at one point, "The road to hell is paved with good intentions." Bottom line: this song is very well-intended, and somewhere between heaven and hell.